Neuronal PAS domain-containing protein 2 (NPAS2) is a nuclear protein and a component of the circadian clock oscillator which includes the CRY proteins, CLOCK or NPAS2, BMAL1 or BMAL2, CSNK1D and/or CSNK1E, TIMELESS and the PER proteins. BMAL1-NPAS2 heterodimers activate E-box element (3'-CACGTG-5') transcription of a number of proteins of the circadian clock. This transcription is inhibited by a feedback loop mediated by PER, and also by CRY proteins. 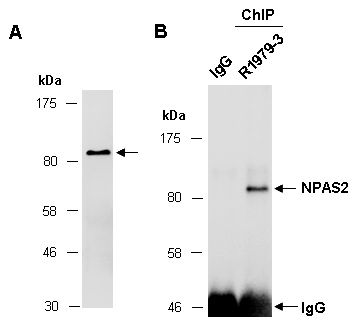 Rabbit polyclonal antibodies were produced by immunizing animals with a GST-fusion protein containing the middle region of mouse NPAS2. Antibodies were purified by affinity purification using immunogen. followed by WB with the same Ab at RT for 2 h.